"Donald Trump, apparently magically in 1979 without realizing it, launched the terrorist war. In 1979 he wasn't even in business in Manhattan, but he was so precocious as a young man, so filled with talent that all of this is due to him," Gingrich said to chuckles before getting serious. "Now, do you know how deranged you have to be to say this with a straight face?" That headline could have ended with the word deranged. Her campaign is obviously STUCK IN THE MUD!!! but she can't make any changes because she is on record, publicly criticizing Trump for making two changes in his campaign's leadership while boasting he knows how to hire the best. So YAY!!! 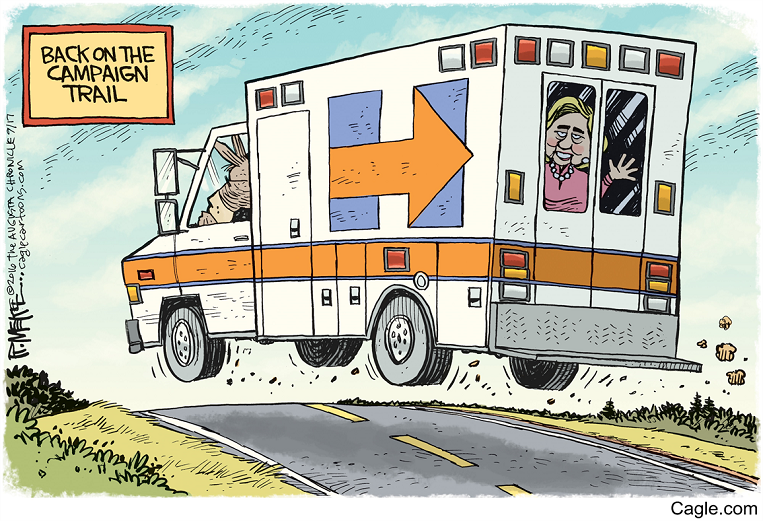 this is the Hillary we can expect to see, coming on down the homestretch! LOOK!!! There she goes now!!! Wave to Hillary everyone!